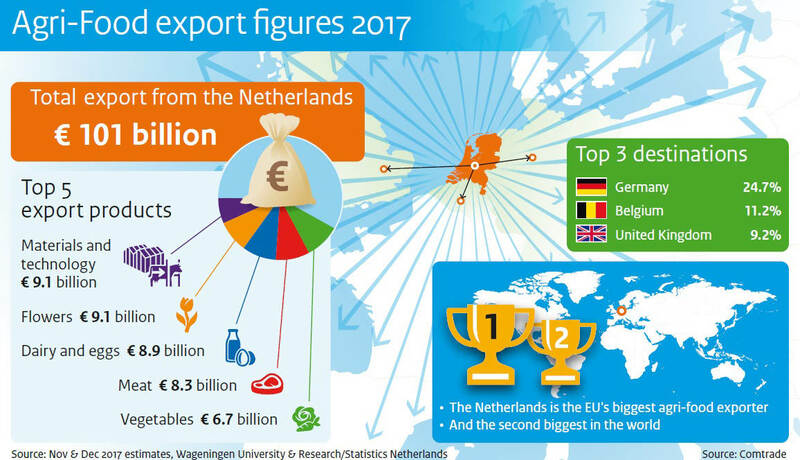 In 2017 the Netherlands exported €91.7 billion in agricultural goods. This marked another new record, up 7% on 2016 when exports totalled €85.5 billion. Last year the Netherlands also exported agriculture-related goods such as farm machinery, chemical fertilisers and plant protection products worth €9.1 billion. These provisional figures (produced by Statistics Netherlands and Wageningen Economic Research) were presented today by the Minister of Agriculture, Nature and Food Quality, Carola Schouten, at International Green Week (IGW) – an agricultural trade fair held every year in Berlin. Most of our agricultural produce is exported to Germany. The next biggest export markets are Belgium, the United Kingdom and France. Fruit and vegetables (including potatoes) are the most popular Dutch products in foreign markets, accounting for over 13% of total exports in 2017. Meat and meat products represent nearly 12% of exports, while ornamental plants and dairy products and eggs each account for 10%. Exports of dairy and eggs, animals and meat, and oils and fats all rose sharply in 2017. Last year agricultural exports generated €44 billion for the Dutch economy. Some €40.5 billion is attributable to products made in the Netherlands, while €3.5 billion came from goods that were first imported before undergoing limited processing and then being exported. If agriculture-related products are included, the contribution to the Dutch economy rises to €48 billion. The figures highlight the importance of the European single market: 78% of Dutch exports of processed and unprocessed agricultural goods go to other EU member states. The Dutch agrisector is also a major player globally, making the Netherlands the biggest exporter of agricultural goods after the United States.